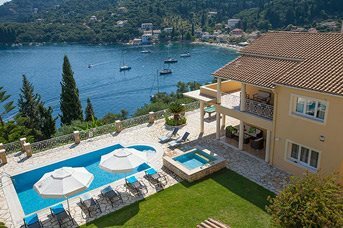 Kalami is on the North East Coast of Corfu nestled between the mountains and the sea and gives your holiday a real taste of authentic Greece. This traditional village is in a really beautiful setting surrounded by olive and cypress groves, beneath hillsides perfumed with orange and lemon trees. The bay is lovely, with a sheltered crescent of Blue Flag beach where you can have a go at water-skiing or canoeing or hire a pedalo or small boat to explore the coast. If that is all too busy for you, just set up a base on the sand and pebbles with your sun lounger and umbrella, close to a beachside taverna where you can top up with snacks and cold drinks while you soak up the rays. If you want a more active holiday, right outside your villa there are miles of gorgeous, unspoilt countryside to explore on foot, bike or horseback. 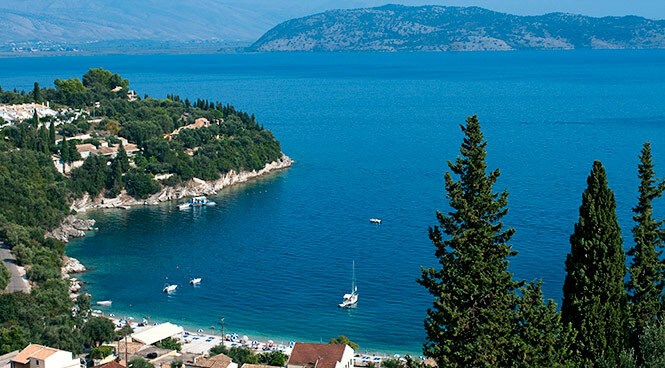 The bigger resort of Kassiopi is a short 15 minute drive away with a greater choice of shops, bars and restaurants. There are also regular buses to Corfu Town or you can travel there by boat for a different perspective of the coast.Kalami is on the North East Coast of Corfu nestled between the mountains and the sea and gives your holiday a real taste of authentic Greece. This traditional village is in a really beautiful setting surrounded by olive and cypress groves, beneath hillsides perfumed with orange and lemon trees. The bay is lovely, with a sheltered crescent of Blue Flag beach where you can have a go at water-skiing or canoeing or hire a pedalo or small boat to explore the coast. If that is all too busy for you, just set up a base on the sand and pebbles with your sun lounger and umbrella, close to a beachside taverna where you can top up with snacks and cold drinks while you soak up the rays. If you want a more active holiday, right outside your villa there are miles of gorgeous, unspoilt countryside to explore on foot, bike or horseback. 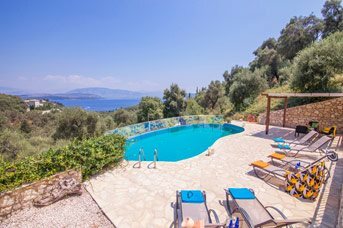 The bigger resort of Kassiopi is a short 15 minute drive away with a greater choice of shops, bars and restaurants. There are also regular buses to Corfu Town or you can travel there by boat for a different perspective of the coast. You can get the everyday basics in the village if you want to cook at your villa - you will have no problem finding English newspapers and there are 2 small supermarkets and a couple of gift shops selling Greek crafts and souvenirs. You can generally find a greater variety of souvenirs in Corfu such as locally made gold and silver jewellery and other craftwork. You will find all kinds of things made from the local olive wood and very good soap made from olive oil, (there are said to be 3 million olive trees in Corfu, but we haven’t actually counted them!) Locally made ceramics, lace and embroidered linen are high quality, inexpensive and widely available in Corfu Town as well as leather belts, wallets and bags. If you want to visit Corfu Town and avoid the hassle of parking, the local buses are reliable and take around 40 minutes. The buses run roughly every hour in the summer until about 8 p.m. Campiello, the oldest part of Corfu Town is a UNESCO World Heritage Site, with historic churches and a maze of narrow cobbled streets, a 10th-century fortress, pavement cafes and hidden leafy squares. The Archaeological Museum is also well worth a visit. For serious shopping head for the new part of town where you will find upmarket designer boutiques alongside familiar stores such as M&S. For a different kind of adventure, you can enter another world in Albania, which was shrouded in mystery for many years under communist rule and closed to outsiders. Now you can travel there by hydrofoil in just 40 minutes! You could explore the World Heritage Site of Butrint which was once a major trading post. You can see how, over the centuries the Greeks, Romans and Ottomans all left their mark here, with archaeological treasures including an amphitheatre and temple. The amphitheatre dates from the 3rd century B.C. and would once have seated an audience of over 1500 people. The multi-talented brothers Lawrence and Gerald Durrell caused quite a stir when they moved to Kalami with their colourful entourage! Lawrence was a novelist, poet, dramatist, and travel writer whose most famous work is 'The Alexandria Quartet'. His younger brother Gerald was a naturalist, zookeeper, conservationist, author, and television presenter, famous for the zoo he founded in Jersey. He also wrote books based on his life as an animal collector and enthusiast such as 'My family and Other Animals,' which if you are in your sixties and grew up in the UK you probably studied at school. In March 1935 Lawrence persuaded his new wife (the first of four!) his mother, and his siblings including Gerald to move to Kalami, then a tiny fishing village, so they could escape the grey skies and the constraints of polite English society and live more freely.